Do not adjust the display controls while driving so that full attention may given to vehicle operation. The following ECO INFO mode will appear on the display by pushing the ECO information button, then turning the selection dial to scroll through the different screens. While driving, only one ECO information screen is displayed. The vehicle must be stopped to scroll through the different screens. Records of up to the past 4 days of fuel consumption can be shown on the display. Records of up to the past 4 weeks of each week’s fuel consumption can be shown on the display. 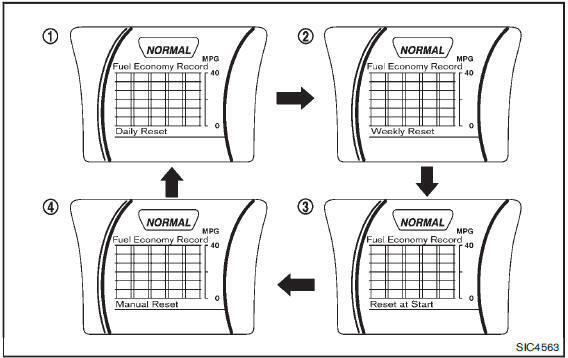 When the clock is not set, the ECO information (daily and weekly) cannot be used. Records of up to the past 4 times of each time of ignition switch ON fuel consumption can be shown on the display. Records of up to the past 4 times of resetting fuel consumption can be shown on the display. The displayed ECO INFO can be reset by pushing the ENTER button for longer than 1 second.